"Strange women, lyin' about in ponds, distributin' swords, is no basis for a system of government. Supreme executive power derives from a mandate from the masses, not from some farcical aquatic ceremony!" The film owes much of its low-budget grandeur to location shooting in Scotland�sweeping landscapes, ominous mountains, genuine castles, and skies both beautiful and threatening lend the film a sense of reality that most comedies never achieve. Gilliam and Jones treat the material seriously, with considerable effort devoted to costumes (designed by Hazel Pethig), cinematography, lighting and atmospherics (almost every exterior scene is drenched in fog or smoke). Filth and mud provide a convincing (if somewhat inaccurate) sense of the Middle Ages, and Neil Innes' songs (with lyrics by Idle, Chapman and Cleese) are hilarious and memorable. All of this was achieved on a six-week shooting schedule, minimally funded (primarily by pop music stars seeking a tax avoidance mechanism) but fueled by enthusiasm, talent and sheer willpower. Budget limitations are even responsible for one of the film's most successful conceits�none of the Knights have real horses, but simply trot through the scenery while their faithful servants provide horse hoof sound effects with coconuts. The device comes to seem quite natural after a few reels, its absurdity simply part of the fabric of the film. And Terry Gilliam provides sharp, impeccably-timed animated "bridges" to connect the segments, preserving the flavor of the classic Monty Python's Flying Circus television series, while also saving on production costs. The Python troupe is in fine form here, with each member assaying multiple roles to great effect. Graham Chapman maintains a Shakespearean sense of dignity as King Arthur that enhances the surrounding silliness. Human comedy is provided by Eric Idle's false bravado as the cowardly Sir Robin (mercilessly tormented by his minstrels, headed by Neil Innes), John Cleese's unthinking dedication as the overly enthusiastic Sir Lancelot (who murders numerous wedding guests to rescue an unwilling participant), and Michael Palin's youthful innocence as Sir Galahad the Chaste (who encounters a bevy of beautiful, eager young women). Terry Jones takes the role of the dim-witted "man of science" Sir Bedevere, and Terry Gilliam plays Arthur's faithful servant Patsy. 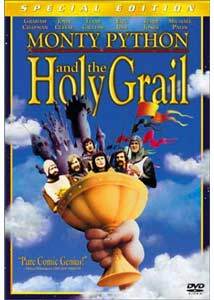 Of course, everyone turns up in additional roles, notably Gilliam as the wizened keeper of the Bridge of Death; Palin as Dennis, the politically progressive radical peasant; Cleese as a Black Knight who insists on fighting even as his limbs are summarily removed by Excalibur, and Cleese again as a goofy French soldier who mercilessly taunts Arthur and his "silly English K-Nig-Hts." And longtime female Python associate Carol Cleveland is great fun as the innocently sexual Zoot, architect of Sir Galahad's intended seduction (and primary beneficiary of the 24 seconds of footage restored for the 2001 re-release). Monty Python and the Holy Grail is a marvelous comedy, rising effortlessly to heights of inspired silliness in the classic Python mode. Logical arguments are taken to illogical extremes, minor character traits become major obstacles, and authority is questioned and ridiculed at every opportunity. The film assumes its audience knows the broad outlines of the Arthurian legend, wasting little time on exposition, and most of the jokes and comic moments work very, very well. It looks great, respects its audience and itself, and holds up more than twenty-five years later. Great stuff. There are issues with the subtitles, see the "Extras" section below. Image Transfer Review: Monty Python and the Holy Grail is presented in its original 1.85:1 widescreen theatrical aspect ratio, with a solid anamorphic transfer drawn from a new, restored print struck for the 2001 theatrical re-release. The DVD, though not officially a "Superbit" release, follows the high-bandwidth trend established by Columbia TriStar's premium line, devoting a dual-layer disc to this 92-minute feature. The result is a solid transfer that preserves the soft look and naturalistic colors of the live-action footage, as well as the crisp richness of Terry Gilliam's animated bridge sequences. Fine environmental details like smoke, fog, mud and grass are well-captured, and the digital compression handles the film's moderate level of grain with no smearing or blocking. The low-budget film shows its age at times, but I can't imagine it looking any better on DVD than it does here. Audio Transfer Review: Soundtrack options include the original monaural English audio (in Dolby Digital 2.0 format for ProLogic-decoding to the center channel), a new Dolby Digital 5.1 remix, and a mono French-language track. The disc defaults to the mono English track, a nice touch that purists will appreciate, and the film sounds clean with no pops or crackles, though dialogue is a bit muddy in spots; frequency and dynamic range are limited by the film's low budget and analog recording technology. The 5.1 remix generally spreads out the music (written by "seventh Python" Neil Innes, with other music drawn from the DeWolfe music library) and atmospheric effects, with a few stereo pans applied where sounds could be separated from the mix; the remix generally respects the original track (though some sound effects were reportedly re-recorded). The French track has a dubbed, dated character, and the performances suffer in the translation; either of the English soundtracks, with French subtitles engaged, would seem a preferable option. The menu audio deserves a special note, with full-blown Dolby 5.1 sound that fills the room with Pythonesque sound effects. The film itself sounds dated but solid on DVD, a fine presentation. The first Swedish joke subtitle is missing from the film's title card, apparently removed to provide a clear background for the French, Spanish and "For People Who Don't Like the Film" subtitles that occupy that space on 3 of the 5 subtitle tracks. The joke kicks in on the second card with no further errors, but it is a change from the film's original form. Some DVD players (Sony and Toshiba at last report) have encountered issues with the subtitle tracks in general, in particular a tendency for the English subtitles to "turn themselves on" at each chapter stop. The disc features 5 subtitle tracks, including a relatively bulky Screenplay track, and the "Follow the Killer Rabbit" special feature may also be playing a role in confounding certain players' firmware. I encountered no such problems with my aging but trusty Panasonic A-120 DVD player, nor with a low-end Oritron DVD player I keep around for such occasions. Monty Python and the Holy Grail: Special Edition is thoroughly deserving of the SE designation�in the tradition of the comprehensive book the Pythons published to accompany the film's original release, the DVD is chock-full of worthwhile supplemental material. Standard features include 28 full-motion chapter stops and subtitles in three languages. The 2-disc set contains a wealth of non-standard, highly Pythonesque supplements. Co-directors Terry Gilliam and Terry Jones, recorded separately and edited together, contribute a running commentary on the making of the film while also sharing recollections about the history of Monty Python. Gilliam (whose voice always seems stereotypically American, though his pronunciation is influenced by his years in Britain) does most of the talking and laughs quite a bit, while Jones interjects on occasion. Between the two Terrys, the commentary touches on budget issues, lost locations, the Middle Ages, the 24 seconds cut during preview panic (and restored to this version), and their seat-of-the-pants work as fledgling film directors. An informative and entertaining commentary by two key members of the Python troupe. A second commentary track is provided by the rest of the surviving Pythons�Eric Idle, John Cleese and Michael Palin (Graham Chapman, sadly, is no longer with us), recorded separately but nicely edited together in overlapping fashion. This track provides a slightly different perspective, with more attention paid to who wrote what and a strong sense of the team's fondness for the film. Lots of laughter and intelligent remarks illustrate the chemistry that Eric Idle once characterized as "the greatest comedy fighting team ever assembled." An innovative feature presents the film's screenplay in large-font text overlays while the film is running, implemented using a subtitle channel that occupies the full screen area when necessary. Reading it at speed is sometimes a bit of a challenge, but this approach is preferable to the DVD-ROM solution seen on some titles, if only because it is more accessible to all DVD fans. This is a gag subtitle channel, with bits of dialogue drawn from William Shakespeare's Henry IV, Part II, rearranged to sound like a mangled and paraphrased version of the standard subtitles. It reads as though translated into another language or two and back into mock-Elizabethan English, and it's funny for a little while, though the joke ages quickly. This feature, a takeoff on the "Follow the White Rabbit" feature pioneered by The Matrix, provides some unusual, valuable insight into the production. When the Killer Rabbit appears, a press of the DVD remote's "Enter" button branches to stills of Terry Gilliam's preproduction sketches and rough storyboards. When a rabbit in a green eyeshade appears, the film branches in similar fashion to "The Accountants' Version," including notes on locations and reproductions of receipts for animal rentals, extras' lunches, and unusual props and materials. It may have been intended as a joke, but this is one of the more valuable and innovative features I've seen on a DVD. This feature provides musical excerpts from the film, with lyric subtitles so fans can sing along. Unfortunately, the lyrics are not accompanied by a bouncing ball, making this more of a karaoke experience than an old-fashioned sing-along, but the intentions are good. The songs include Knights of the Round Table, Sir Robin and the Monks' Chant (complete with head-banging instructions... using the DVD box, heh-heh). This substantial new 47-minute documentary (directed by the film's production designer, Julian Doyle) sends Terry Jones and Michael Palin on a tour of the production's shooting locations. They tour Dune Castle (where most of the castle exteriors and interiors were filmed) and visit the gift shop, buying a copy of their own screenplay and learning that most of the tourists who come through are familiar with the movie. Palin displays the warmth and curiosity that made his BBC travel series such a success, and Jones points out key locations with accuracy and enthusiasm. The documentary is in 1.78:1 anamorphic format, nicely transferred, and it's a fine addition to the DVD. How to Use Your Coconuts, a new three-minute short film, stars Michael Palin as a government bureaucrat who illustrates the use of coconuts to produce the sound of horse's hooves, as seen in the film. The Japanese Version features eight and a half minutes of footage from the dubbed Japanese release, with re-translated English subtitles indicating some of the cultural adjustments made in the process (for example, the Knights of Ni demand "Bonsai!"). A seventeen-minute BBC Film Night television report features interviews filmed during one day's shooting at Dune Castle; there are a few awkward splices, due to lost material or clumsy editing, but the interviews are fairly candid and not overly "fluffy" at all. Old Rubbish contains several still images of preview posters and press releases, along with a brief reading from a negative review of the film. Artefacts presents still images of 5 posters, including 2 original posters, 2 international posters, and the poster from the 2001 restored re-release. Photos contains a gallery of 83 full-color behind-the-scenes snapshots from the production. Trailers presents the original UK trailer, as well as the 2001 US re-release trailer, which adds a simple coda to the original trailer promoting the digital, widescreen re-release. The trailer is quite funny in its own right, starting with a series of bad voice-overs and segueing into an elitist narration that compares Holy Grail to the obviously superior works of Kurosawa and Bergman�delivered in Japanese with subtitles. The Cast presents an interactive cast directory, listing all of the characters portrayed by each of the Pythons (and six other cast members), with color photos from the film of each character. It's fun, especially for non-initiates, to see just how many characters are played by the same six men. A single page of easter egg DVD Credits is also included, not-so-hidden under a Grail icon. Monty Python and the Holy Grail�in LEGO reenacts the famous Knights of the Round Table/Camelot sequence, using LEGO buildings, props and figures in all their stop-motion, CG-enhanced glory. A bizarre, oddly hilarious little bit, though the joke is a lot funnier if you're a fan of the film. Location Recce presents a few minutes' worth of stock "home movie" footage of locations purportedly explored by Gilliam and Jones at the production's expense, complete with "directors' commentary" over locations "not used." Unused Ideas collects a number of Gilliam's pre-production conceptual sketches�unfortunately, it's hard to make out what many of the ideas were meant to be, and no additional clues are provided. A screen page advertising the www.pythonline.com website. Columbia TriStar's Monty Python and the Holy Grail: Special Edition is a shining example of the DVD format: a fine transfer of a significant film, with substantial, informative and entertaining supplements. The Python troupe is in top form here, the 1974 production looks and sounds great, and fans will relish the wealth of extra material. Highly recommended.